No time to wash and fold your laundry at home? No time to visit the laundromat? No problem! Our Wash and Fold Laundry service is perfect for EVERYONE – students, families, those on-the-go, and people who just don’t like to do laundry. Take back your time and let us do the dirty work for you! Simply bring us your everyday laundry in a basket or bag. At your first visit, we will give you two laundry bags to use for future visits. There’s no need to bring along detergent or fabric softener. We take care of that part for you. Most customers choose to use our standard detergent, which does a great job. However, we do offer multiple detergents and softener choices, should you wish to upgrade from the detergent that is included with the pricing. Your items get sorted by color, machine washed on a regular setting in cold water, and tumble dried on a medium heat setting. Your freshly washed items are returned neatly folded for a consistent product with every load. Unsure of the proper etiquette when sending your laundry? This service is perfect for items that can be machine washed and dried – pants and shirts, sheets and towels, underwear and socks. There’s no need to separate your items, we just ask that you check your pockets. 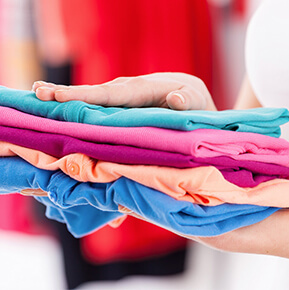 Our professional wash and fold service experts are experienced in handling all clothing with care. Make your budget happy. Our Wash and Fold Laundry Service are priced by the pound, at a rate of $1.48/lb. Visualize filling a king size pillowcase with your laundry. It should weigh about 20 lbs., which equals about $30 worth of laundry. Our turnaround time for Wash and Fold Laundry Service is 1-2 days and is available at all nine of our locations in the Harrisburg area. If you prefer we come to you, we’d love to! You’re invited to sign up for our free pickup and delivery service, should you have an ongoing, weekly need for service. To find out if our pickup and delivery service is available in your area, please contact our designated Customer Service Representative at 717-920-5500 or myfrontdoor@classicdrycleaner.com. Do you have a business that could benefit from our Wash and Fold service? Many local massage studios, wellness centers, hair salons, day spas, and medical offices (such as imaging and sleep centers) utilize our wash and fold service. Our free pickup and delivery service is also available for our professional clients. Contact us today to start enjoying the benefits of wash and fold services. Our professional dry cleaning and laundromat services are here for your convenience.